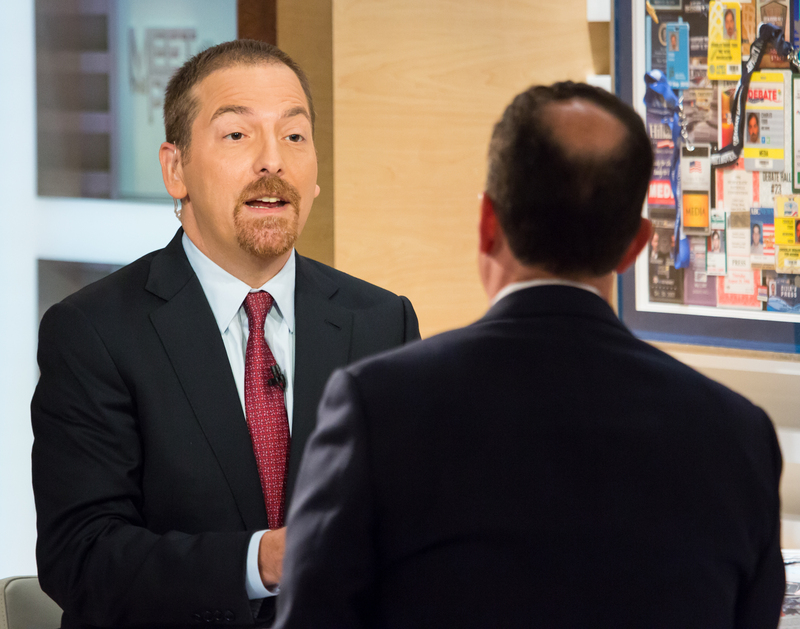 “Talk to the critics…” The Chuck Todd plan to restore trust in Meet the Press. 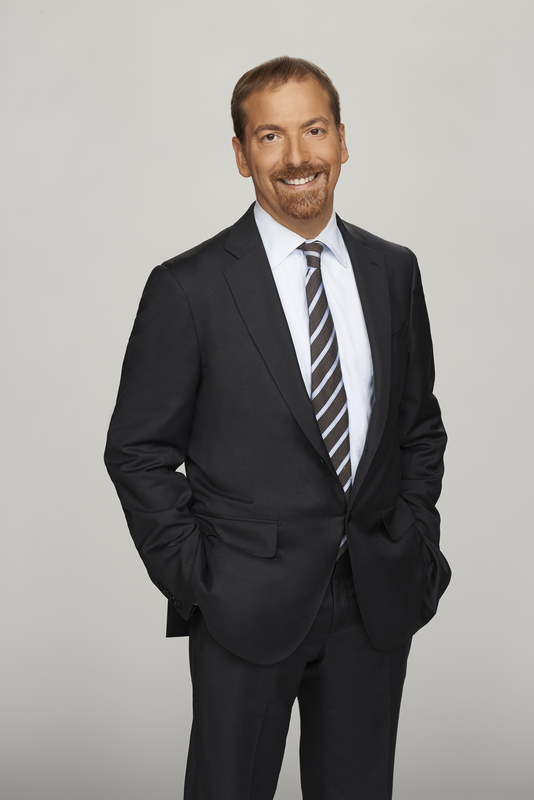 A disgusted viewer and longtime critic of the Sunday shows — that would be me — interviews NBC's Chuck Todd about his attempt to remake the most famous of those shows. Chuck Todd: I think there are too many folks in my business who are too defensive and desperately hope things return to the so-called “good old days.” The media landscape has changed. We need to adapt. We need to acknowledge new players. When I say it’s time to talk to the critics and the skeptics, it means engaging, hearing new ideas. Perhaps incorporating some or dismissing some but at least explaining why. Have the two-way conversation. A lot of media critics don’t know what happens behind the scenes and sometimes that does matter. For instance, just because we don’t air a story, doesn’t mean we didn’t report it out. Just didn’t deem it worth airing. 2. PressThink: You mean the “good old days” of one-way media without a lot of choice for the users? Chuck Todd: Exactly. Look, I have an incredible platform, I get that. But that doesn’t mean we are the only game in town. We have to acknowledge the entire landscape, maybe even change how we report. For instance, in the “good old days,” not reporting a story that didn’t pan out was enough to make sure an untrue story didn’t make it into the eco-system. Now, there are a number of ways untrue stories can go public. We in the so-called MSM should be willing to report what is not true, rather than ignoring and claiming that “well, we didn’t deem it worthy” and therefore don’t have a responsibility for debunking someone else’s rumor. I’m not sure we can defend not sharing publicly what we know is true and false. 3. PressThink: Would you agree with me that “he said, she said” reporting (and “he said, she said” roundtables!) have been a disaster for public confidence in the press? Chuck Todd: Of course. I think there is no such thing as “fair and balanced.” It’s simply “fair.” As for whether it is a disaster? I think the disaster is how the politicians play into this. It’s a two-way street. My philosophy is trying to make sure different perspectives are represented when it comes to opinion about the political landscape, but this should not get in the way of facts. 4. PressThink: The words are said to be Daniel Patrick Moynihan’s, “You have a right to your own opinion. You do not have a right to your own facts.” But if there’s one place on the dial where it seems that important people do have a right to their own facts, it’s the Sunday morning talk shows. How did that happen? Where did it go wrong? What was the fatal moment or crossing point? Chuck Todd: Where to begin. I think the advent of advocacy TV interviewers being available helped accelerate this a bit. Then you have the coordinated campaigns on the left and right to pressure news organizations on balance. And too many executives in general felt the heat enough to then decide “make everything he said, she said” because it was deemed politically safe. Realize: there is an industry out there that feels their job is to try and create doubt about the MSM with partisans, and it really is a business decision in order to drive folks to their own POV programming. I think there are some true disagreements over facts that we shouldn’t pretend don’t exist. For instance, when it comes to tax policy, the disagreement on facts comes from assumptions about consumer behavior that can change over time and not be something you can pin down as factually accurate. And let me add one more thing. As for the change on Sundays over time, I think the overall pressure from cable when cable went daily with political discussions pushed folks in charge of Sunday shows to emulate cable. 5. PressThink: Which is how Jon Stewart became your most effective critic. His show is essentially about the excesses and stupidity of the cable news formula. Chuck Todd: Cable news has become an easy target, that’s for sure. I prided myself on how little my cable show ended up as an example. Of course, you don’t get credit for that. I think there is this perception that the American public has about Washington right now—and they’ve thrown all of us in the media with it—that we’re out of touch. We don’t understand what’s going on. We’re all caught up in the process of the Acela Corridor. Being in Washington, we’re not experiencing what the folks ‘between the Fives’ are experiencing. We got caught up in that Washington-New York mind-set. One is: you’re not a Washington insider yourself, by background at least. Middle class kid from Miami, not a creature of the Acela corridor. “I’ve got my own kitchen cabinet of relatives who’ve had to live through some of the hard realities of this recession,” you have said. Second answer: Political journalists can regain credibility by showing that they “get it,” which for you means listening to people beyond the Fives (Interstate 95 on the East Coast, I-5 in California) and then translating — that’s the key word for you, translating — their anxiety and frustration into tough questions for public officials. A third answer is to hear more often from people involved in politics “out there” between the Fives, who are not close at hand in Washington, as with your conversation with three mayors from other cities about what’s working elsewhere. Fourth answer: Diversify the guest list. No more “elected pundits,” office holders who are simply repeating what they read on the op-ed page. Broaden the mix, as with John Stanton of Buzzfeed or Thomas Frank, author of What’s the Matter with Kansas. So I have several questions about the Chuck Todd plan to restore trust in Sunday morning political television. First. What did I miss? Chuck Todd: You have done your homework. Relevancy— that’s the only other thing I’d add. Try to make sure we’re relevant to what the country should be understanding about what’s going on. 7. PressThink: How do you think political journalism, your profession, became over-identified with the politicians and insiders themselves? You’ve said that voters and viewers now lump you and your colleagues in with the people who have made a mess of politics. How did that happen? Chuck Todd: The one-two punch of the Iraq War and the recession. Basically two huge things that the folks in charge blew and we in “the media” appeared to go along in only explaining the government’s side of “why.” So Iraq started eroding trust, then the recession nearly finished the job on trust erosion, thanks to the glorification of Wall Street by the media in general over the ’90s and early 21st century. Toss in the fact that we in the media lived in the two areas of the country that did not experience the recession, and it’s a toxic stew. Since the folks who were at fault never got punished, the media didn’t appear to be on the public’s side, but instead looked to be collectively on the side of the elites. 8. PressThink: So if I understand that answer, smart people in political journalism should have realized that the near total lack of accountability for these huge disasters was going to come back on them, that they weren’t doing enough to perform in the watchdog role they hold out for themselves. Is that a fair summary? Chuck Todd: Yes. And let me stipulate, perhaps it is easy for me to backseat drive. I wasn’t covering the White House at the time. I was covering the political landscape, covering elections for a trade publication, then behind the scenes here [at NBC News] doing similar work. I’d like to think that when given the opportunity, I would have been more skeptical; but sometimes for beat reporters, seeing the forest can be difficult, no matter how hard you try. I now have an opportunity to constantly be the person that is hopefully seeing the forest too. 9. PressThink: I would remind you that your predecessor, David Gregory, said several times that he thought the press did a fine job in the run-up to the Iraq War, that all the important questions were asked, that criticism including Washington journalists in the list of institutions that failed is misplaced. I found that astonishing, that he would continue to say that in retrospect. Did you? Chuck Todd: He was a daily beat reporter. I’m sure he and others did ask plenty of skeptical questions. But that skepticism didn’t always make it on air or in print and then I don’t know how editors and producers were treating those questions once the reporters made it on air or in print. It’s not an excuse, just explaining that there is a way for both things to be true. Let’s also remember, this doesn’t happen without a slew of political leaders all marching to the same drum, all using the same sources to justify their positions. But this is where the anger at the press began. We’re mad that the politicians lied or misled us either on purpose or accident. But sadly, maybe the public expects politicians to lie or mislead. What they want is a press corps to help them hold these folks accountable, especially after the fact. 10. PressThink: I have been a faithful viewer of the Sunday shows for more than 20 years, and I felt my own frustration grow during that span. One thing that jumps out at me as a critic who switches among them is the unbelievable uniformity of these shows, not only in basic format but in the guest list, the questions, the topics. When Fox and CNN entered this derby with Chris Wallace and Candy Crowley, their shows were almost carbon copies of Meet the Press, Face the Nation, and This Week on ABC. It’s like a single mind is producing them, but it has 50 pairs of feet. If you’re going to change that, it seems to me the first step is to figure out: how does that happen, that kind of group think. So why do you think it happened? Chuck Todd: Well, TV has a history of copying what works. When CNN and Fox came along, they looked at what was working (in this case MTP was number 1) and that became the formula to copy. This has happened in the radio and TV biz (both news side and entertainment) since the day after Marconi invented it (I kid, sort of.) Now, the issue of booking has become a lot more complicated, even more than I realized before I took this job. An amazing number of folks simply are afraid to go out on the Sunday shows, so there’s that. As for the topics, I am trying to change that. I think there is an expectation (and as a viewer, I would have it) that the Sunday shows delve into the most important issue of the day or week, and we are living in a big news period so I imagine you won’t see the diversity of topics for the leads of these shows. But where I’m trying to do things differently is at least have diversity of topics in the middle of the show. Use that space, frankly, to experiment with what works and what doesn’t. But to not be afraid. I did the tax cuts segment (using Kansas as the backdrop) a few weeks back, about a week before the New York Times and others did. Don’t think any other show has even done it yet. Specifically, the issue of how the Kansas governor’s race could actually change the tax debate. That’s a big deal and could change the tax debate in Washington and all 50 states. 11. PressThink: Here’s another thing that really puzzles me about the Sunday shows. I get why you have the chairman of the Foreign Relations Committee on when Obama is about to go to Congress for authorization. He’s a player. I don’t get why a certain class of insiders — professional operatives, paid manipulators, official mouthpieces, “party strategists” — are regularly invited on. I don’t think they should ever be on. Debbie Wasserman Schultz. Reince Priebus. Mike Murphy. Bob Shrum. Four names that stand for many more. We know going in they’re not going to be anything but boosters for their side. I mean, if you wanted to stoke people’s frustration with politics, a perfect medium for that would be a “he said, she said” segment with Wasserman Schultz and Priebus, which has happened in past years on Meet the Press. You just had Priebus and Murphy on last month. I don’t get it, Chuck. The whole practice makes no sense to me. Can you explain? Chuck Todd: I think it’s unfair to lump some of these folks into one category. Priebus is the head of the GOP; he attempted to release a series of principles that I think was designed to be the GOP’s message for the midterms. He’s the head of the party. The party is trying to win the senate, so it seemed appropriate to probe that. He was relevant that week. I agree, you don’t just put him on because, well, “I need a GOPer,” why not him? There has to be a reason. He unveiled something that appeared to be an attempt to be a sequel to the 1994 Contract with America. So it’s worth questioning him. As for the use of political strategists, some are good and plugged in and have information that will help the viewer understand the why. For instance, why a party or a candidate is doing something. Murphy is someone who isn’t predictable when it comes to assessing his own party. And he understands campaigns at a granular level that can be helpful to the viewer who wants clarity and the answer to the question “why.” I understand your larger complaint, and that is, folks who spout the most predictable answers. If I thought Murphy was doing that, I wouldn’t use him. 12. PressThink: Do you think you are part of the professional political class? Would you include yourself in it? Chuck Todd: I don’t think any political reporters should be categorized in that, and I wouldn’t want to be classified in that group. I’m not an operative. I’m a reporter and analyst. “Meet the Press” has been on the air since 1947; Richard Nixon and Ronald Reagan each appeared on it seven times, Obama a dozen. It trades in a sense that it’s an important thing for important people to do. Todd, too, has probably been reminded more than once that a large part of his job is theatre. And Todd is good at it, in a character-actor sort of way, which is probably the best approach; it leaves open the possibility of acting up. What I found interesting is her suggestion that Meet the Press is theatre, not in the negative sense of “show business” when it should be serious, but more in the positive sense of: drama, urgency and an acting out of the country’s passions through politics. So my question is: can Meet the Press be good theatre and how do you make it so? Chuck Todd: I can’t escape the fact that most folks will only judge the show’s success by numbers, not by content. I happen to think the content will drive the numbers over time; so that’s my bet and clearly my bosses are making that bet. I’m not exactly someone who was created in a TV lab. But right now, there is a tendency to try and be splashy and so urgent that it risks actually under-cutting what a Sunday show should be and what viewers actually want, which is content and clarity. That said, you have to be watchable. Mary Poppins had it right: just a spoonful of sugar helps the medicine go down. I love politics and I respect the potential our democracy provides us. I want more folks to care about what’s happening. Part of that is to help them understand the game (when necessary) and then help connect the game to the impact on their lives and on the Republic as a whole. So, I want to make the show watchable and fulfilling. Does that mean some will think we are creating “good theater?” Perhaps, but if that so-called theater helps give context and clarity, then it’s worth it. 14. PressThink: It seems to me that one of the most powerful things a show like your could do is bring into legitimate debate people, causes, ideas and problems that have been placed in the “sphere of deviance” or marginalized by the rest of the political class and by journalists. As in literally never spoken of in power circles. Is this something that has occurred to you, since you are overhauling Meet the Press? Look, on this, you are preaching to the choir. The challenge I’m discovering: it takes time to produce the show you want. This is an aircraft carrier. I’m turning it. Come back in six months and let’s assess how I’ve done. 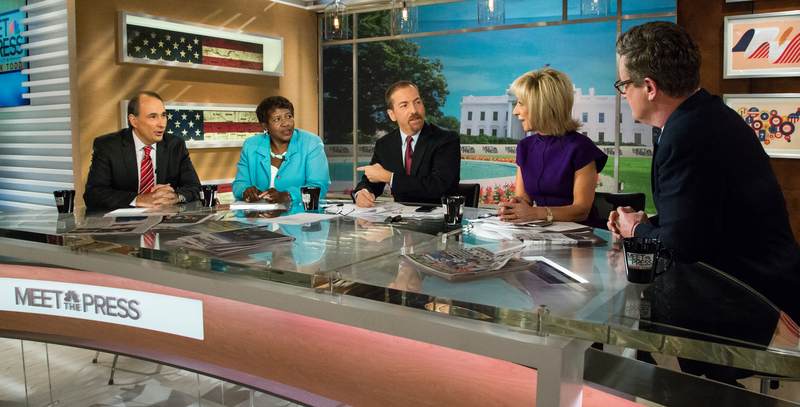 My commentary: I think you have to give Chuck Todd some credit. He realizes the Sunday shows have failed. He knows they have to change. If he doesn’t change Meet the Press enough, he can be criticized for that. He understands that viewers and voters regard Washington journalists as part of the political class, even though he does not see himself that way. What interested me most was his reply to question 7. Journalists as a class failed to appreciate how they participated in the utter lack of accountability for the failures in Iraq and after the financial crisis, he said. Most people in his profession are still in denial about that. Chuck Todd is not. I was disappointed in his answer to No. 11 on the “professional operatives, paid manipulators, official mouthpieces, and party strategists.” I think that’s where he showed himself to be trapped in his professional skin. He didn’t understand my question about “good theatre” (no. 13.) He treated it as: how do you get viewers to eat their vegetables? (Spoon full of sugar, natch.) But that was my fault. I should have clarified it, and re-asked. Slipped up there. He had a robust reply to No. 14 on “the sphere of deviance,” pledging to — in effect — give voice to the voiceless. That’s impressive, and something we can hold him accountable for. Amy Davidson’s characterization is right on. Chuck Todd is more of a character actor than a “leading man” type. That makes him less predictable. But it leaves open the question of what kind of character he intends to be. Photo credit: Pete Williams, NBC. Used by permission. I realize you can only ask so many questions, but I hope in your next dialogue with Todd (or other insider political journalists) that you can broach the subject of the Correspondents Dinner and what a terrible impression it leaves upon the public and their industry. I don’t understand how journalists can interact in such an incestuous event with the very people they’re tasked with covering without feeling like manipulated tools. Are they even remotely aware of what kind of impression it gives to have the journalists who were widely seen as having laid down for the Bush Administration in the run-up to the Iraq War, then sit around drinking and laughing at Bush joking about not finding WMD’s? It’s the equivalent of having the NYPD throw a big party co-hosted by the mob, in which they all get up and joke about all the crimes they got away with and how stupid the cops were for not catching them. The entire event is a disgraceful display that deserves to be shelved permanently, and I’d like to hear Todd or other journalists try and defend their role in the embarrassing charade. When I read that, I really hoped the conversation would dig in on precisely this aspect of the Sunday shows, particularly. What are those complexities? Even the one he specifies (scared to come on) remains opaque. One presumes he means politicians or candidates but are their others? This booking process seems to be precisely where the decisions are made as to who gets shoved in front of our faces so the mechanics and the politics of it seem to me acutely worth investigation and analysis. How many guests arrive as a consequence of their own lobbying or the lobbying of some PR entity representing them? We know this happens as in the Pentagon’s military analyst/message multiplier case. That comment left me bewildered as well. I know there are folks who stage-manage their image & appear much less than they’re asked (i.e. Hillary Clinton). But who are these people who are “afraid” to go on and why? If it’s policy experts who don’t like TV cameras, that’s one thing. But if it’s power brokers who don’t want to step into the spotlight (i.e. the Kochs), refusal to appear seems like something viewers should be looped in on. Um hello? As far as I’m aware, “The folks who were at fault” aren’t actually dead yet. So if Chuck Todd thinks the media should hold government officials accountable for their crimes, why doesn’t he start by doing some serious REPORTING on the crimes that led to Iraq and the financial collapse? If those crimes were reported on TV, perhaps they would lead to punishment. After all, there is no statute of limitation for war crimes. What is this “between the fives” trope? California was one of the hardest hit states during the recession — unemployment went over 12%. It’s still over 7%. More evidence that Mr. Todd and his colleagues are so marinated in rightwing dogma that they are, and intend to remain, absolutely clueless and useless as journalists, and very very valuable to the right. When is he going to stop booking two and three Republicans to one Democrat? When is he going to book someone *as* liberal as the rightwingers that he hosts every single week? So they have Luke Russert, a plainly biased rightwing journalist, to represent the “liberal” side while Joe Scarborough represents the other “journalist” side. And they merrily pretend that it’s somehow “balanced”. I guess Todd has banished Maddow from the show because his rightwing friends can’t keep up with her, and they don’t like it. I have no expectations that Chuck Todd is going to improve Meet the Press. When will he stop accusing the President of the United States of not mentioning “Syria” during the interview when the President mentioned Syria at least four times moments earlier! Chuck Todd is an idiot. Obama had by then “said the word Syria” four different times. Pure sophistry, on Todd’s part. Check out this map from NOAA. there on the left coast? That’s “outside the fives.” There on the right coast? That’s “outside the fives.” A huge chunk of their potential viewing public. So what/ who is Todd playing to — people or acreage? I will bet good hard dollars that the vast majority of his guests already represent “inside the fives.” Even leaving *out* John McCain. Man, these people — meaning beltway journalists — are clueless. Just marinated in rightwingerism. All of his answers tell me that he still doesn’t get why people are frustrated with the news shows. He can’t see the forest because he’s one of the trees. Yeah, he’s not going to make the show better. I have little faith in that. I would have asked him about his past comments that it’s not “his” job to report the truth and that it’s the administrations fault for not getting “their” message out. Basically saying that the one who yells the loudest are the ones who win the cycle, regardless of whether or not everything they’re saying is bogus. People like Chuck Todd are what’s dividing and destroying this country. Re: would have asked him about his past comments that it’s not “his” job to report the truth and that it’s the administrations fault for not getting “their” message out. He addressed that in his AMA chat with Reddit. Meet-the-Press (MTP) is beyond redemption… and Chuck Todd certainly lacks any understanding of the basic problem, much less any actual power to change things at that NBC relic. Today’s MTP broadcast was vacuous and superficial as always, even featuring pseudo-journalist/dinosaur Tom Brokaw and other clueless, establishment panelists. Chuck had a softball interview with worthless news source Susan Rice. They still don’t get it at MTP, not even a little. Chuck has been thoroughly assimilated by the Beltway Borg since his early days as a GWU student… and is incapable of seeing the larger political and journalistic reality. New MTP ExecProducer (John Reiss) was “Hardball with Chris Matthews” producer, replacing the demoted Rob Yarin. The suits at Comcast/HQ NBC really hate 3rd Place Sunday Ratings and are demanding more “edge” to MTP production. That imported MSNBC crowd knows neither edge nor journalism. Be sure to tune in next Sunday/decade for the same old thing at MTP. 1.Elitism: the Sunday morning shows stand accused of embodying the worldview of a permanent political class (not only elected politicians, but their attendant industries in lobbying, bureaucracy, public relations, fundraising, philanthropy, and the media) along the Acela Corridor, as opposed to interrogating it. 2.Blind Spots: being so immersed in that worldview, the shows have become unable to notice errors in the assumptions made by this permanent political class and to articulate the policy options that it overlooks or suppresses. The Invasion of Iraq and the Collapse of the Financial Markets are exhibits A & B. 3.Narrowness: the permanent political class, and by extension the Sunday morning shows, having become disconnected from the body politic proper, not only have blind spots regarding policy options on known issues, but also refuse to acknowledge the existence of a diversity of other issues, which therefore never appear on the agenda for debate. 4.Talking Points: the internal relations between the competing factions and coalitions of the permanent political class are now so calcified that its public commentary on the issues of the day has taken on a ritualized, predictable opacity, making for the dullest of television: talking-point soundbites that alternate between pabulum and evasion. Let’s stipulate, for the sake of argument, contra Rosen, that Todd is capable of positioning Meet the Press (see #12) outside the permanent political class, giving it the dual role of a) explaining the concerns of the body politic proper to an out-of-touch Washington, and b) explaining the anthropology of Washington to the body politic, in order to account for its failure. 1.Shift the Issues Debate: besides diversifying the agenda, there is a second way to alter the debate, namely to move the focus away from the politics of an issue to the underlying policy options that precede the formation of political platforms. Todd alludes to tax policy debate in #4; and to the lack of a policy debate in #7. Guest rosters would have to change accordingly to include more academics, authors, organizers, researchers; fewer elected politicians and political operatives. 2.Think In Quadrants: one problem with the He Said, She Said formula is that it shoehorns all issues into opposing talking points along a single political spectrum left-vs-right, liberal-vs-conservative. Politics, however, are also organized top-vs-bottom, elitist-vs-populist. The coalitions of both political parties contain both elements. Populists are virtually disenfranchised on Sunday mornings. 3.Triangulate: occasionally foreign policy issues are presented as more complicated than two-way either/or debates. Sometimes the neocon is pitted against the internationalist against the isolationalist. Getting away from the Crossfire mentality of one-from-the-left and one-from-the-right is essential to break the ritualized rote responses of prepared talking points. Actual interview segments do not have to be structured as three-way melees, but one-on-one questioning can be organized according to triangular principles, asking a politician to answer criticisms from multiple ideological points of view. 4.Not Just the Fives: I know that Todd is far too sophisticated a psephologist to characterize the principal divide in the electorate as the coasts and the flyover heartland. So let’s take his “between the fives” comment to The Daily Beast (#6) as shorthand for all those who feel alienated from the permanent political class, not just geographically so. It goes without saying that the sense of disenfranchisement also applies economically, racially, generationally, and so on — all areas currently underrepresented and underaddressed by Meet the Press. Chuck Todd was both the natural and unnatural choice to take over MTP. Natural because of his political beat, unnatural because he’s not a TV star (Ah there, Lawrence Spivak). I like the “character actor” analogy, too. I think he could actually do this job, create his own Russert effect. Stimulating interview. Thanks. Jay, this conversation was enlightening, a public service. My impression, from working with Chuck and hearing Chuck give presentations to journalists, is that he’s unaware of what reporting is. He says, “I’m not an operative. I’m a reporter and analyst.” But he does no reporting. Certainly no accountability reporting. Occasionally he does have a theme or a meme that he asks NBC producers to do reporting on, to fulfill whatever storyline has already been written. What sort of work did you do with Chuck Todd and in what context? Look at the federal tax code. There have been many news reports on the tax code since the 1986 reforms and EVERYONE knows that the code has been repeatedly corrupted by lobbyists and special interest groups. But the voters have never done anything to stop Congress from creating at least one new tax deduction for anyone with enough money for many large campaign contributions. So all of the hard work by the many reporters was an almost complete waste of time. Their only positive accomplishment was the money they earned for entertaining voters “and” politicians with gotchas. Which is why they failed to hold Congress accountable. They were entertaining their customers instead of educating voters. As a result, everyone knows that the tax code has been corrupted but very few voters really know what is in the code. Therefore they can not set goals to make their politicians accountable. But no one in the news media is interested in communicating like a teacher because they think their time is too valuable to be wasted on educating voters. Everyone wants to believe that the problem can only be solved by implementing more draconian campaign finance reforms because they are too narcissistic to see themselves as they really are. Since the reforms of 1986, all of lobbyists and interest groups have repeatedly protected their own interests, because they know exactly how carries the electorate is. Every citizen but has the same fear of new taxes that they are suddenly taxed as a middle layer in the league. web and on web I found this website as a most excellent web page for newest updates. How can different perspectives represented when one is economically dependent on them? Is not it more likely that you follow his donors? So if you weigh it, so it is certainly not wise, nor economically feasible to oppose that which pays the presence. Its obvious Todd has a super ego. What he lacks is integrity and boy does it show!